I am not entirely sure how I missed the second challenge...but I did...RATTS!!! And here's my take on the sketch...for some reason this sketch screams Halloween to me...so who am I not to listen??? I am linking this card to CSSC #3. Awesome card, love the sketch, best I get working on one, I might have missed this one thanks for posting. YAY! 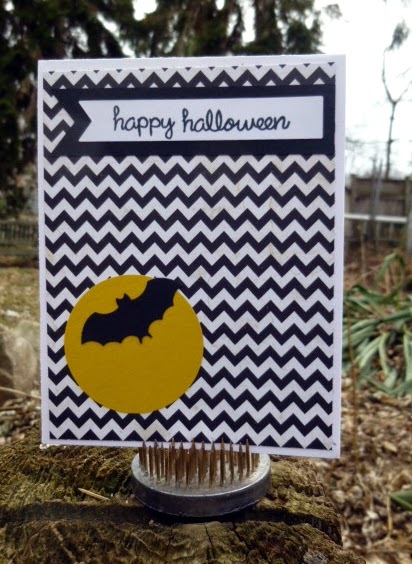 A Halloween card in April - PERFECT! Thanks so much for playing CSSC! 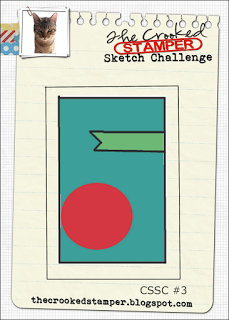 It's the big moon on the sketch that makes you think Halloween. And I say make a holiday card whenever it suits you. From Easter to Halloween... and another CAS beauty! You are on a roll, Donna! Ooooo! Spooooooooky! Something about those chevrons just makes this feel very Halloweeny. Awesome work! ohhh I love that moon & bat! Brilliant!